Ricketts Cricuts: Happy Birthday Brenda! Today is my dear friend Brenda's birthday!! I had to use my favorite Cake cut from Simply Charmed! 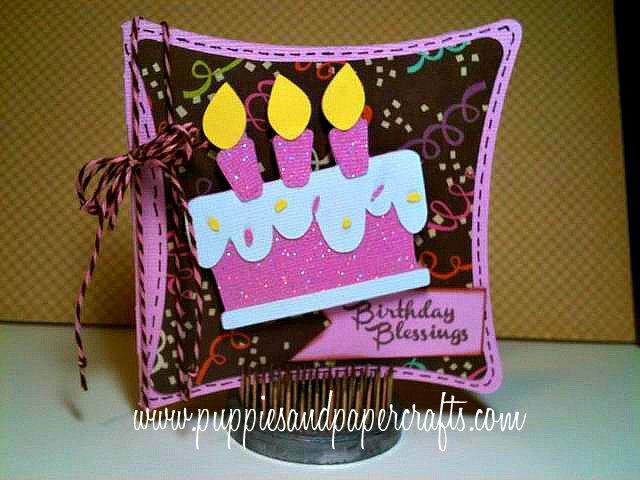 The birthday sentiment is also a SNEAK PEEK from Jaded Blossoms Make a Wish stamp set being released Tomorrow!! Eek! So excited!!! Happy Birthday Brenda!! I hope you have a wonderful day! So cute Kim. I love the card shape and that cake is adorable :) Happy Birthday to your friend Brenda! Your card is so Pretty. Love the colors and the shape. HB2UR friend. very cute chickie love how its cocked to the side and the shape of the card !!! Cute card. Love the shape of the card. I love this card! It's soooo cute!